Browsing the Raley’s market just over the Nevada border one early afternoon after skiing, things looked pretty much the usual. I could’ve been at a grocery store in Santa Monica or Malibu. But then at the fish counter, something caught my eye — a red-fleshed Sierra lake trout. I had seen a barbecue out back, the snow wasn’t too bad. So I figured I would smoke a trout! Trout is a fish I don’t think about all that often. It’s always seemed to me like a less vital, shrunken version of salmon. Sure, I enjoy it in a brunchy salad with some champagne. But I’m not even sure I’ve ever purchased a trout before. However, here in the Sierra Nevada, it seemed like the right thing to do. I got the fish back to the house and packed it with rock salt and sugar, then left it sitting on the kitchen counter while I went out into the yard and fetched some pine firewood scraps. I soaked those for an hour or so while the fish brined, then turned on a gas grill low, arranged the wood just above the flame, and smoked myself a trout. With a temperature hovering around 200 degrees, it took about an hour and a half. I peeled back the skin and set the fish on the counter, where it was soon noticed by hungry pre-dinner friends and family who set upon it with relish. In no time we were left with a skeleton. Curtis and I got talking about smoking fish in general. He confessed his love for smoked salmon shmear on bagels. And since he was disappointed he didn’t get to watch the smoking process, I promised to buy and smoke a couple more. “Smoked trout would make some kickin’ shmear, I bet!” said I. The next day I went back to Raley’s and bought two more trout. In the hopes of inspiring future smoked trout on the Tahoe grill with or without me in the future, I put Curtis to work gathering wood chips and preparing the grill. A couple hours later we had another two beautiful fish, smoked to perfection — even better than the first. (I let Curtis take credit for that.) One was presented at the table to be picked apart and eaten with the gnocchi and salad I’d prepared. The other was sent to a shelf in the fridge. In the morning, I cleaned the pale red meat from the bone, mixed it in with some salt and whipped cream cheese and voila! smoked trout shmear. We had a selection of bagels, onion, sesame seed and water, from which to choose. Fortunately, there’s still some in the fridge for tomorrow — I bet smoked trout shmear gives you a good base for that 8-hour drive home to L.A.
Tonight, beef stew — cowboy style. 1 red-fleshed trout (steelhead or bom Sierra), 1-2 lb. 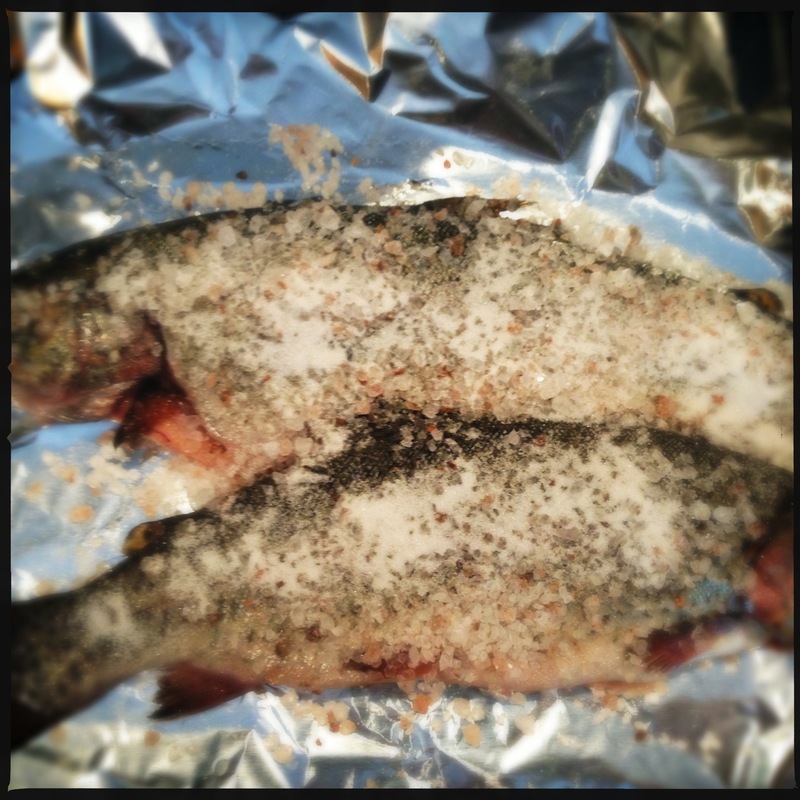 Sprinkle the trout liberally with sea salt (or Kosher salt — don’t use an expensive salt for this) and sugar, cover in foil, and let sit for 2 hours at room temperature, or longer in the fridge. Soak some small pieced of wood (or wood chips) in water for one hour. Heat your grill over medium flame. If the wood pieces are larger, place them on the grates beneath the grill. If they are smaller or chips, place them on a piece of foil on the grates beneath the grill. Turn the heat to low. 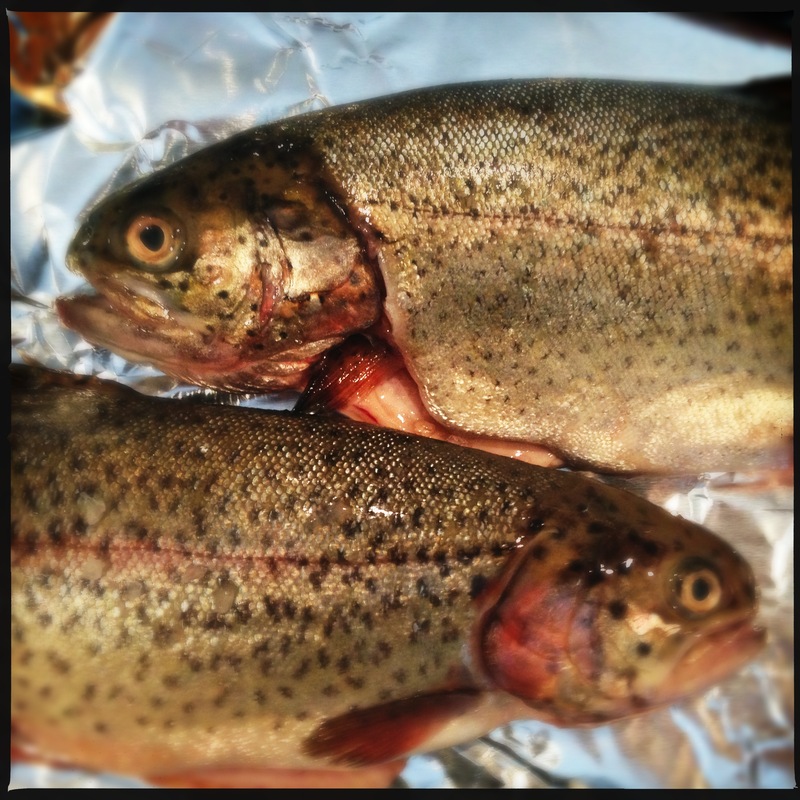 Place the trout on the warmer grill if your barbecue has one. If not, place the fish as far from the heat source as possible. Close the top of the grill. Check often to make sure the temperature is not getting above 250 (200 is ideal). Add more wood if the smoke dies down, or turn up the grill briefly with the top open to reignite the wood. Smoke the fish for 1.5 to 2 hours, until firm and the skin looks smoky and smooth. Remove from grill and cool in the fridge. Scoop the cream cheese from the container into a large bowl. Carefully remove the meat from the fish, being mindful to remove any small bones (and there will be many). Using a fork, mash the meat into the creamed cheese, stirring constantly, until well combined and distributed. Toast your bagels in halves and spread atop each a heaping tablespoon of shmear. Pine for smoking? 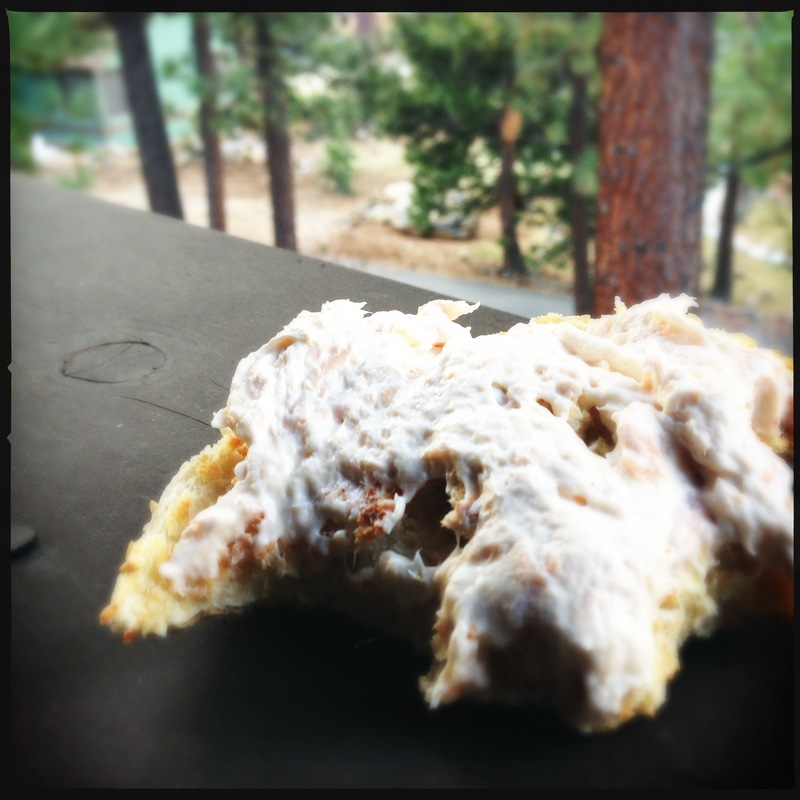 Apparently it turned out well, but what twist of smoke flavor did that impart? I’m intrigued . . . smoked fish is one of my faves (mullet is a local hero) but always heard one should never use pine for smoking. Western pine, Eastern pine difference? I love the convergence — blood and body of… bread and fishes… etc. I love smoked salmon on a bagel or in an omelette. This looks easy. Maybe I’ll give it a try.